Dexter is only a few episodes into its eighth and final season run, but that doesn’t mean that Showtime Networks, CBS Home Entertainment and Paramount Home Media Distribution are slacking on the complete series plans. 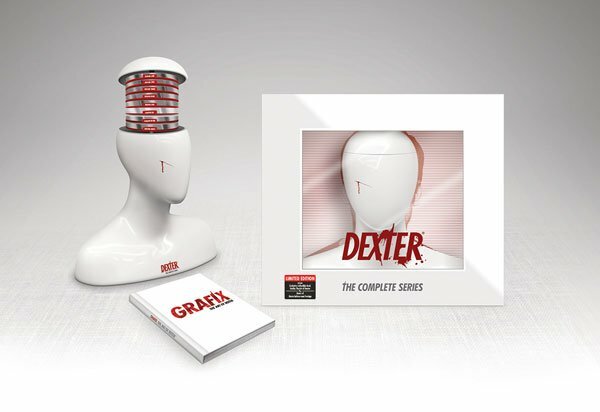 Yesterday, the Dexter crew announced at Comic Con that fans would be getting a complete series set sooner rather than later, and now we have some of the details, as well as two different packages to show you. Additionally, if you’ve already been pretty good about collecting the seasons of Dexter you really dig, Dexter: The Complete Final Season will also be available for buyers. Each and all of the sets will hit outlets on November 5. Honestly, the number of options for the Dexter: The Complete Series Collection is staggering. The above copy is the standard Complete Series Collection, which will come on both Blu-ray and DVD with an actual recreation of the box for the blood slides Dexter Morgan collects throughout the series. 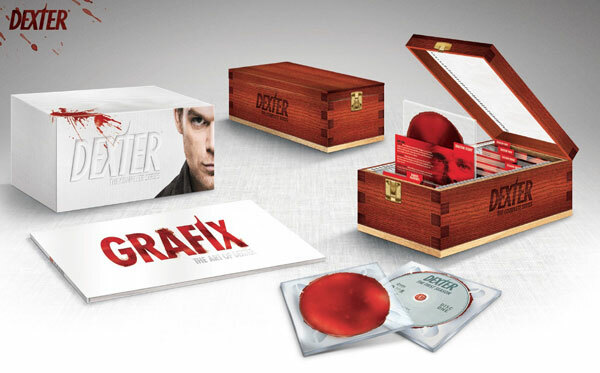 Another unique bonus feature is “Grafix: The Art of Dexter,” a collection of photographs, artwork and other mixed media designs used to promote the series over the years. Beside the regular bonus features that come with each season set, Paramount Home Media Distribution is also promising a bonus disc that will be chock full of featurettes and interviews, offering fans over three hours of extra material to delve into. Unfortunately, we don’t have a complete list of bonus features handy, but we do know several documentaries will be available on the bonus disc. One documentary is called “The Evolution of Dexter Morgan” and will look at how the character has changed over the course of eight seasons. The other documentary is called “The Code” and will assumedly look at the code Dexter uses in order to kill without harming the innocent within the series. Of course, getting your hands on this bonus disc will cost a pretty penny. List price for the Blu-ray is $427.99 and the list price for the DVD is $352.99. Best hope for a sale unless you really, really love the series. If you aren’t digging the blood slide box look, Amazon is also offering its own exclusive gift set packaging for the series, which is already available for pre-order on the retail site. The cost for Amazon’s Blu-ray lists at $544.99 but is already available for a fraction of that cost if you order early. Finally, if you still don’t need or want to shell out hundreds of dollars for the Complete Series Collection, Dexter: The Complete Final Season will run at a more reasonable cost, with Blu-ray copies running for $68.99 and DVD copies listed at $57.99. Right now, you can catch up on Dexter via Showtime. New episodes air Sunday nights at 9 p.m. ET. You can read more about the new season, here.